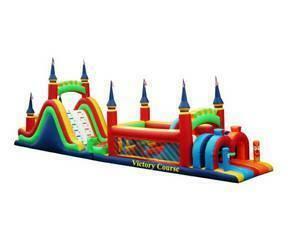 The Victory Adventure is a 65 ft inflatable obstacle course that offers lots of fun and challenges. It has two units connected. This course offers many different obstacles for two rivals, 2 people compete through the different inflatable challenges to see who can reach the end first. Two-at-a-time, participants enter thru the tunnels, climb over the tubed arches & into the obstacle area, over a climbing wall, down the slide, traverse around multiple pillar obstacles, over a larger climbing wall & exiting on the high slide to win!!! Make sure you're up for the challenge!